Top prize for the fourth annual Invention Factory™ competition went to Dongho Kim and John Yoon, both rising sophomores studying mechanical engineering, for their tremor-reducing spoon that will help the millions worldwide who suffer from essential tremor, Parkinson’s or other neurological diseases to eat more easily. The pair will split a $5,000 prize. “I never even thought we'd come up with an idea. This is so surreal," Dongho told the New York Daily News. 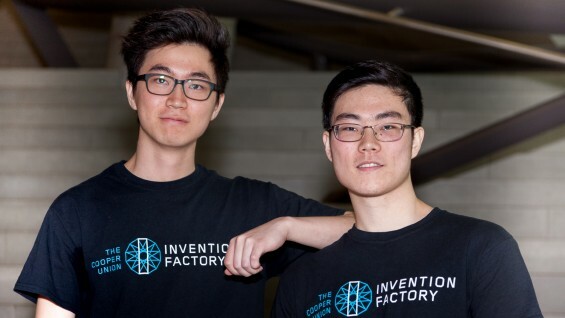 Although there is a battery-operated tremor-reducing spoon on the market, Dongho and John’s solution would be far less expensive to manufacture or buy since it doesn't rely on electronics, nor would it need to be recharged after every three to six uses. 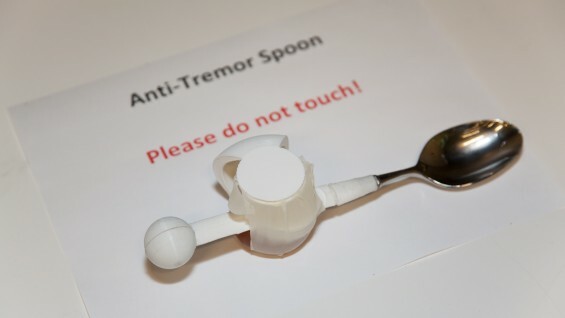 Their “Anti-Tremor Spoon” uses two fluid-filled pouches and a counter-weight to stabilize hand motion, rather than electronic sensors and motors. The $3,000 second place prize went to MingYang “Raymond” Lee and Yueyue “Keira” Li for their “Push-n-TwistScrewdriver” – which fits on a keychain. The device, which uses spring-loaded rods that conform to the shape of whatever screw is being turned, fits and turns all common screws – including flathead, Phillips and hex screws. During the final competition, the pair, both mechanical engineers expected to graduate in 2018, presented two screwdriver prototypes whose rods are sized for regular and larger projects. One of their CAD drawings is shown above. 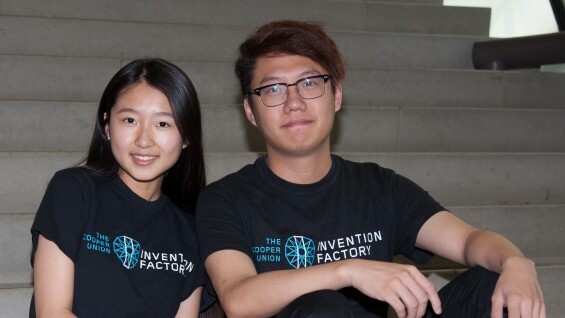 During the six-week Invention Factory program, students are charged with solving a real-world problem or—as in the case with both of this year’s winners—improving an existing product. 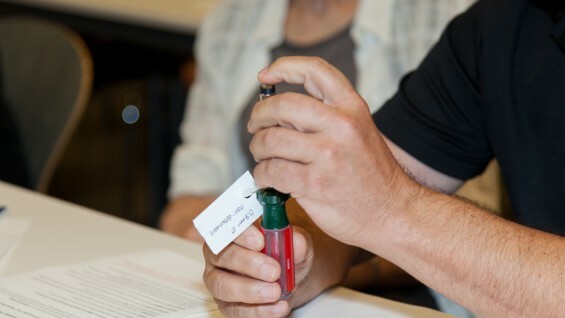 Each week leading up to the July 7, 2016 final, the students present their ideas to guest evaluators who inquire about the product’s engineering, uniqueness and marketability. The weekly critiques help each team refine their design and teach them about effective communication (particularly of a scientific idea). At the final, the panel of nine judges consisted of engineers (Eugene Briskman CE’64 and Ben Itri EE’75), designers (James Kwon, Ellen Lupton A’85 and Uyen “Win Win” Nguyen ME’14), patent lawyers (Barry Negrin ME’89 and Ron Slusky) and two Cooper associate deans (Elizabeth O’Donnell AR’83 of The Irwin S. Chanin School of Architecture and Anita Raja of Albert Nerkin School of Engineering). Other inventions included a tick remover to help stop the spread of Lyme disease, a sensor system to help firefighters navigate in a smoke-filled building and search for survivors, a Mylar-insulated baby carrier to protect premature babies from hypothermia, and an ankle brace that prevents sprains but does not otherwise restrain an athlete’s motion. As with previous years, each of the 10 student teams had a budget of $2,000 for research and materials to build their invention. Invention Factory was created by and overseen by Alan Wolf, professor and chair of physics, and Eric Lima, associate professor of mechanical engineering. For more information on previous Invention Factory winners, visit www.inventionfactory.org. Both professors and several of the student competitors also appeared on NY1 that morning to discuss the program. A photo gallery from the final review can be found here.